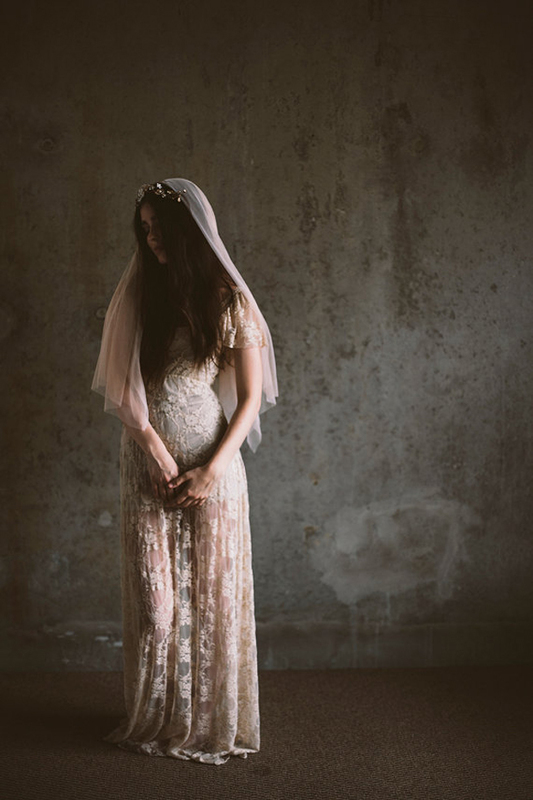 The Most Romantic, Prettiest, Stylish & Unique Bridal Veils You Ever Did See! Home > Bridal Style > The Most Romantic, Prettiest, Stylish & Unique Bridal Veils You Ever Did See! 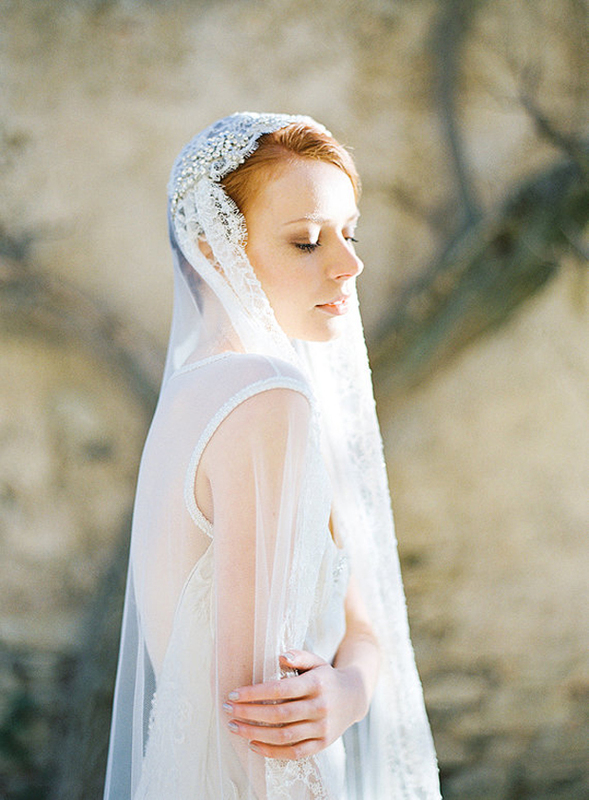 Not all bridal veils are created equal. Oh no, no, no. 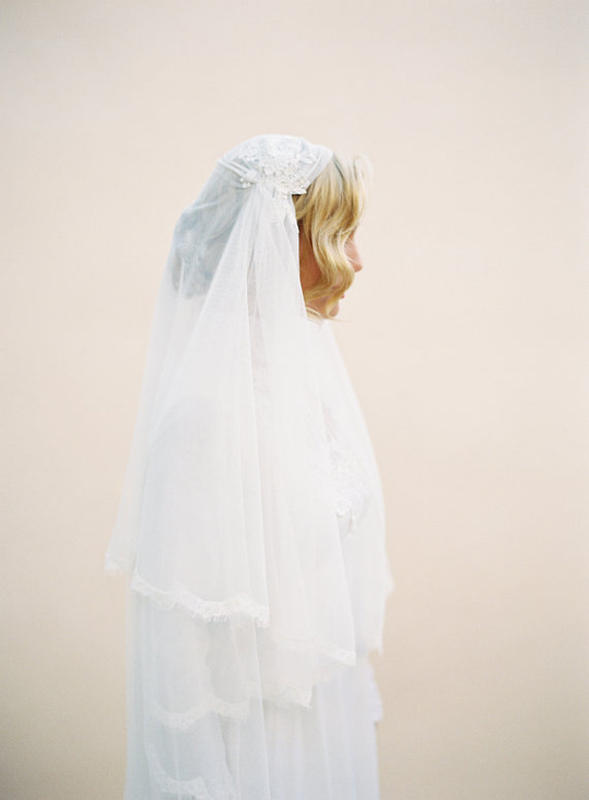 Some wedding veils were created more than equal. So beautiful, romantic and stylish that they just had to be included in this post. 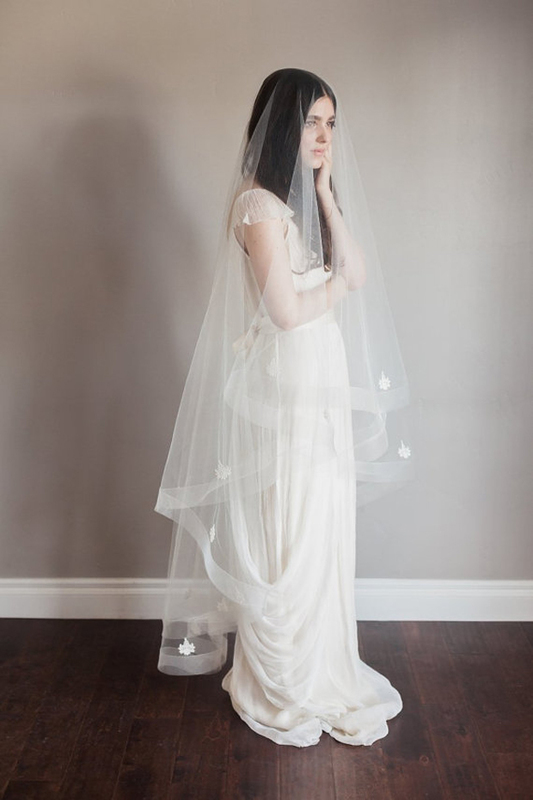 This beautiful train veil is made using glimmer tulle and Russian veiling. The next two veils are stunning! The first is a very delicate beaded vine applique veil. The vines are created with delicate small pearl / seed beads that trail down the sides of the veil. The second is a cute, short elbow length veil with a romantic hand sewn beaded applique design. The design flows from the top of the head to the side and down, all the way around the veil. To adorn this beautiful delicate design there are some silk organza petals added by hand. 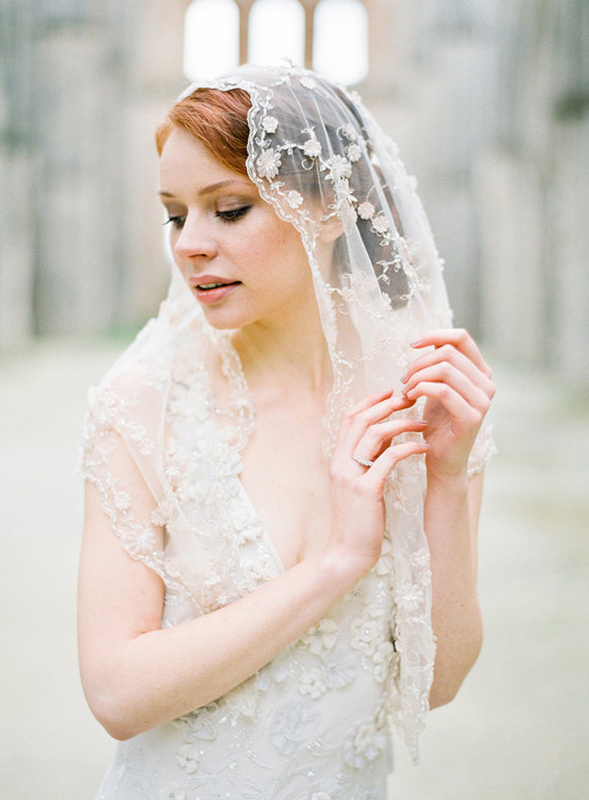 This Bohemian French Chantilly Lace Veil is truly breathtaking. 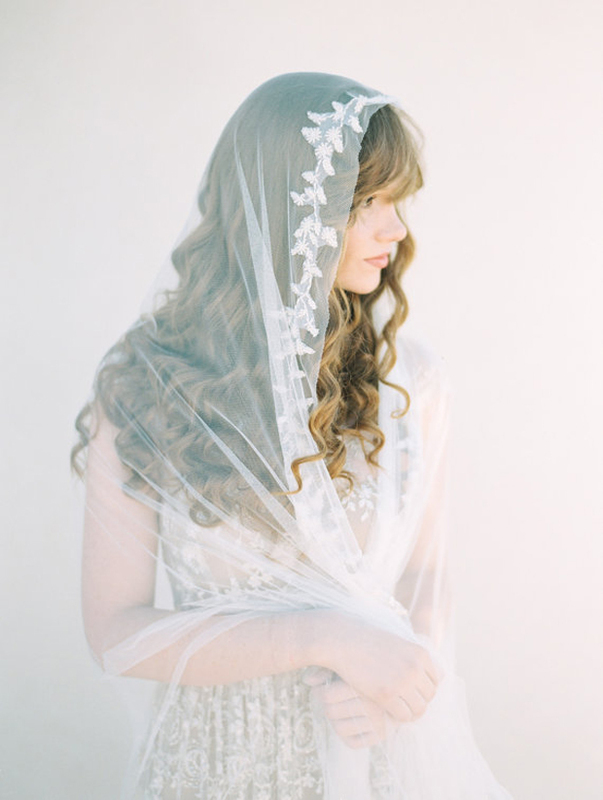 The top part of the veil has a gorgeous crystal design with clear crystals and white opal crystals. 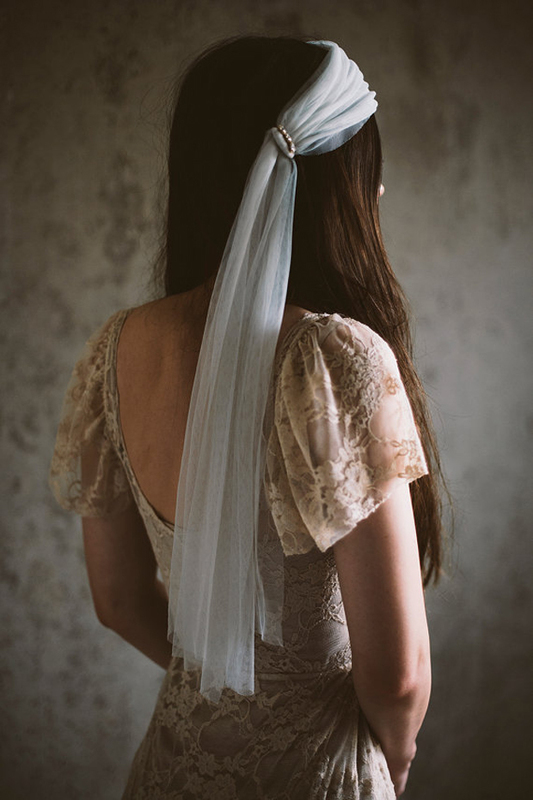 The veil can be worn in the traditional way or can be knotted at the side to give it a romantic bohemian look. 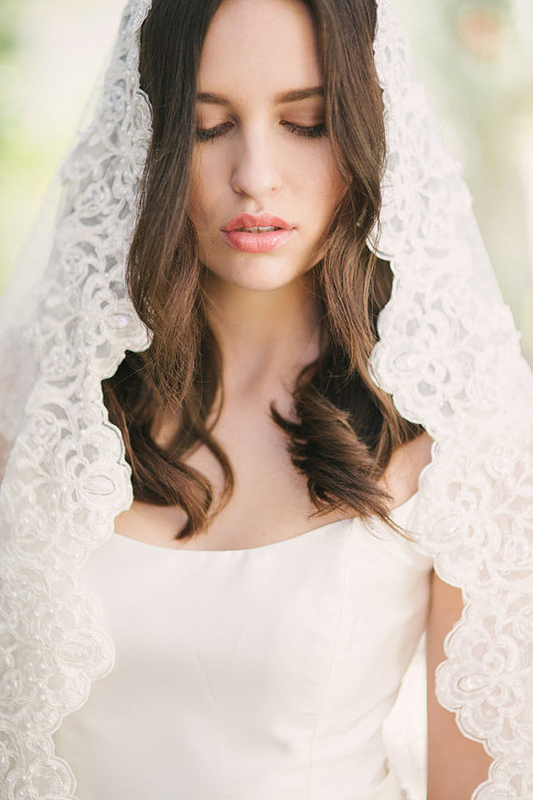 This gorgeous mantilla veil in a polka dot fabric has the softest fabric with an amazing drape. The edge is embellished with beautiful gold lace. 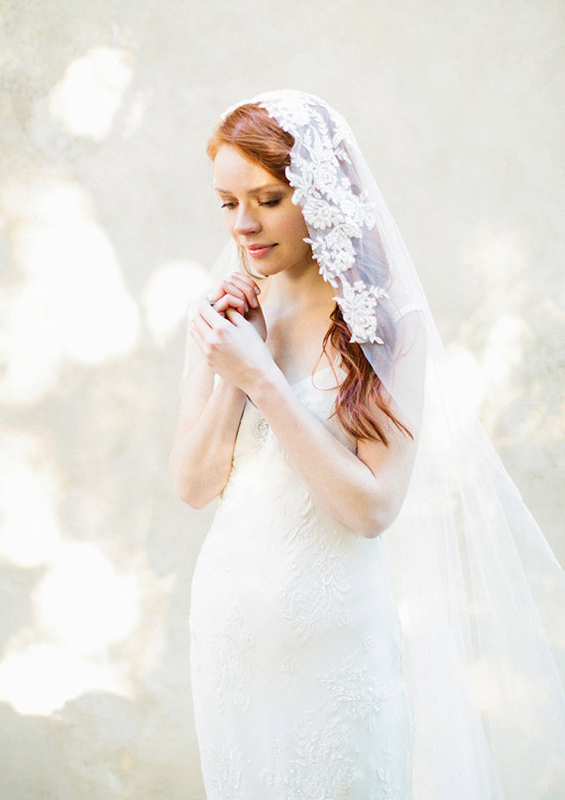 This Juliet Cap style veil is a waltz length veil made with French Chantilly lace and a handmade crystal motif. Breathtaking. 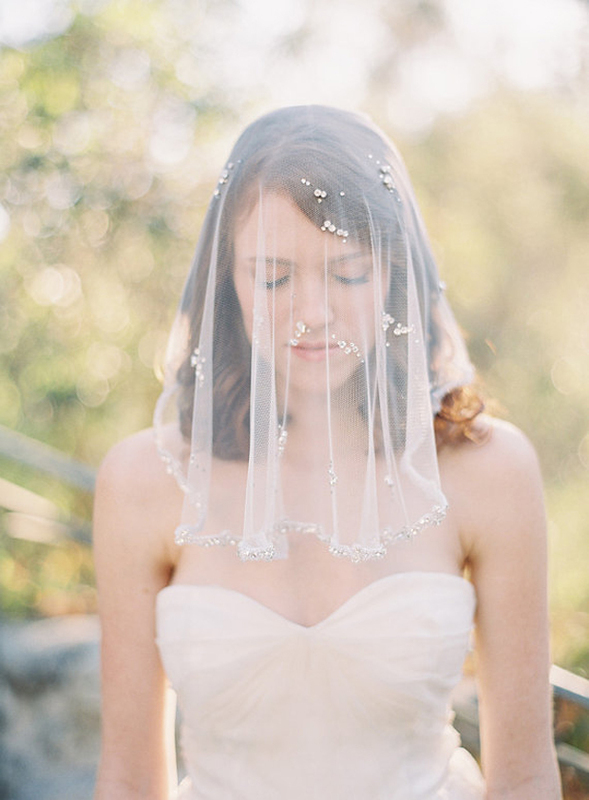 This handmade hand beaded blusher veil is an asymmetrical design adorned with beautiful crystal rhinestones. So pretty! 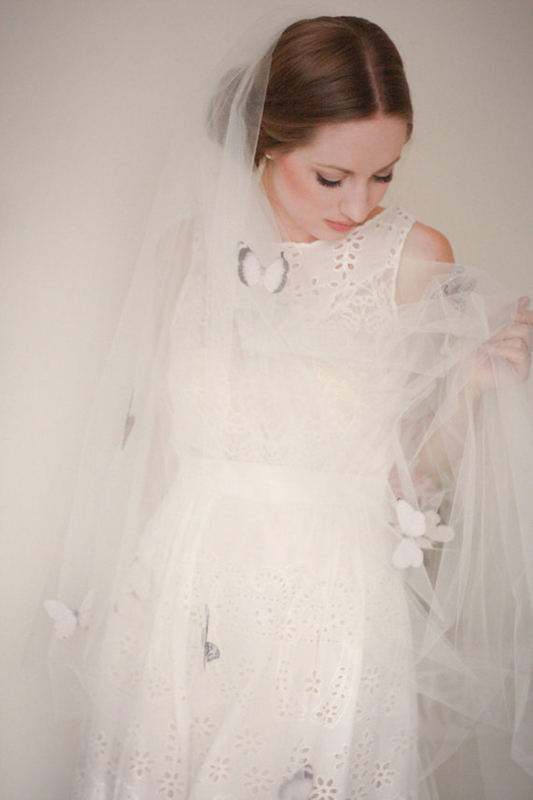 This unusual veil is covered in silk organza butterflies in many varieties, in pretty shades of off white and blush pink with black wing detailing. 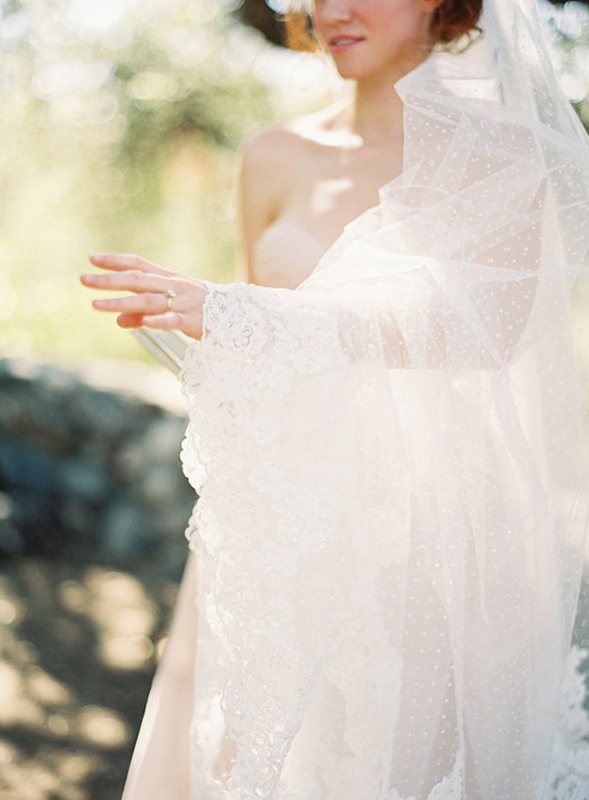 If you’re looking for a totally different veil – this is it! This whimsical ombre dipped bridal veil is made from the softest tulle and can be custom made to your color preference for a charming bridal look. Definitely one of my faves! Simple and classic yet versatile, the first veil in candlelight blush is square in cut and made from the softest English net. English net is softer and has a heavier drape than traditional tulle veiling. The second veil is a unique take on the veil is made with super soft English net veiling, hand sewn with gold plated combs and crystal rhinestone accents. 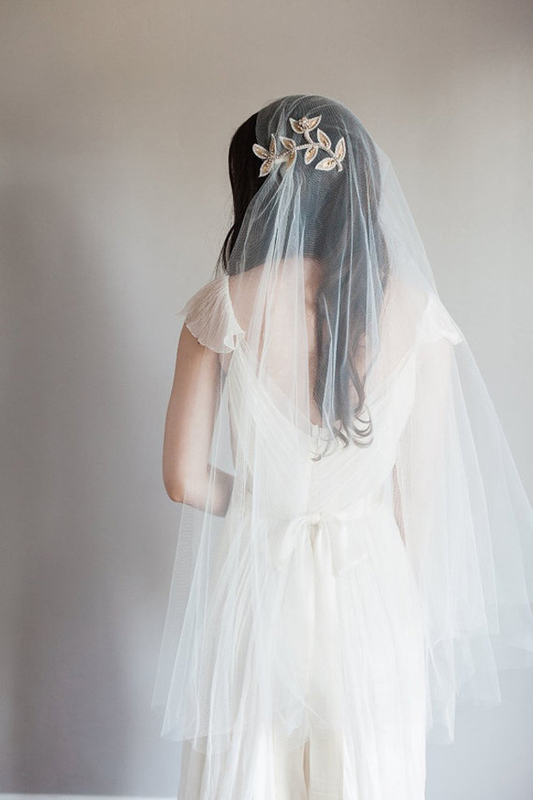 It’s a great bohemian alternative to a classic veil. This lilac bridal veil has that vintage feel to it, inspired by early 1900s bridal fashion and made with ivory tulle, it has silk flowers with petals on one side and one matching flower on the other. Gloriously light and ethereal! 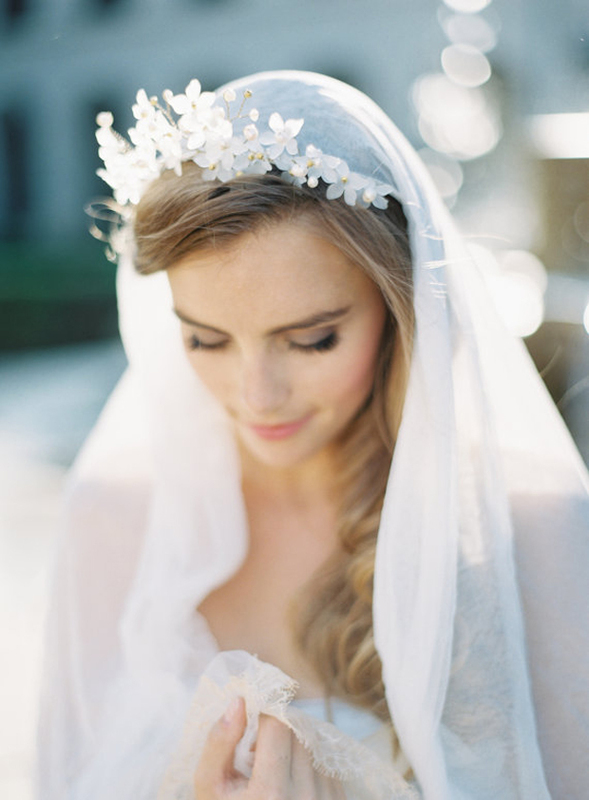 This Juliet Cap Veil is easy to wear, yet substantial enough to fulfill the dream of romance. Choose between a crystal leaf clip or a pearl cluster clip. 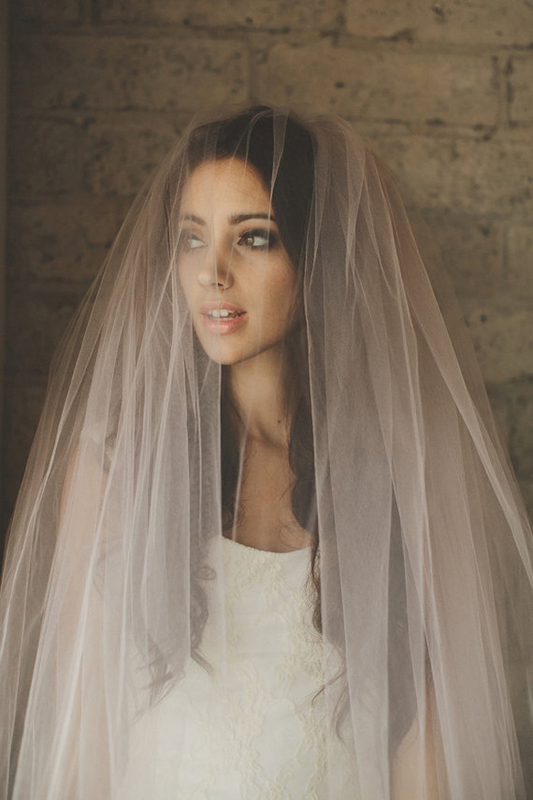 This super simple circle drop veil is gorgeous and made with illusion tulle. 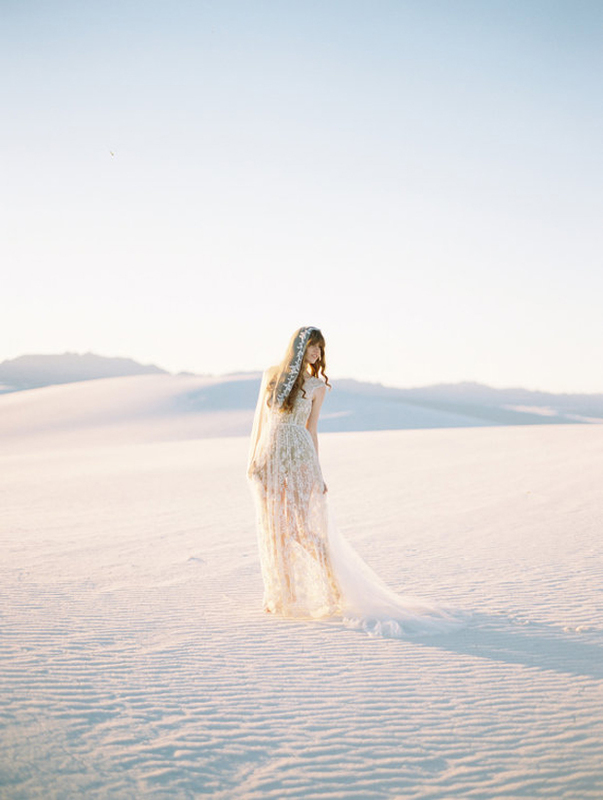 The veil has a clean cut edge that will compliment an array of wedding gown styles. 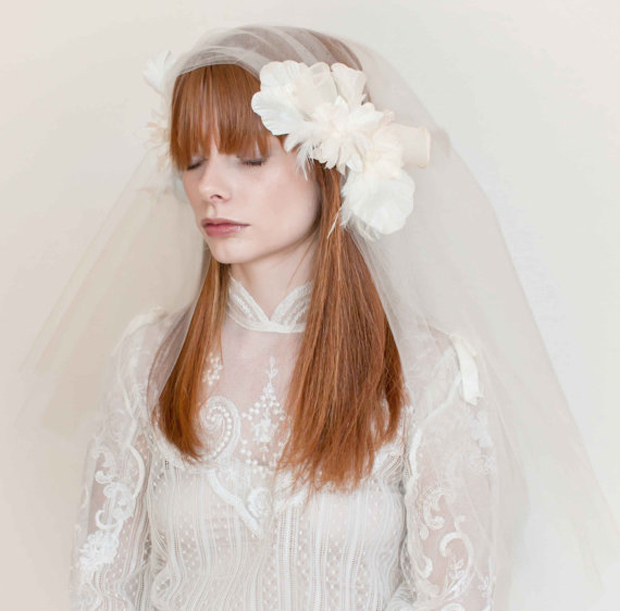 This first veil is a 1920s inspired Juliet Cap adorned with delicately hand trimmed Ivory Alencon lace applique. 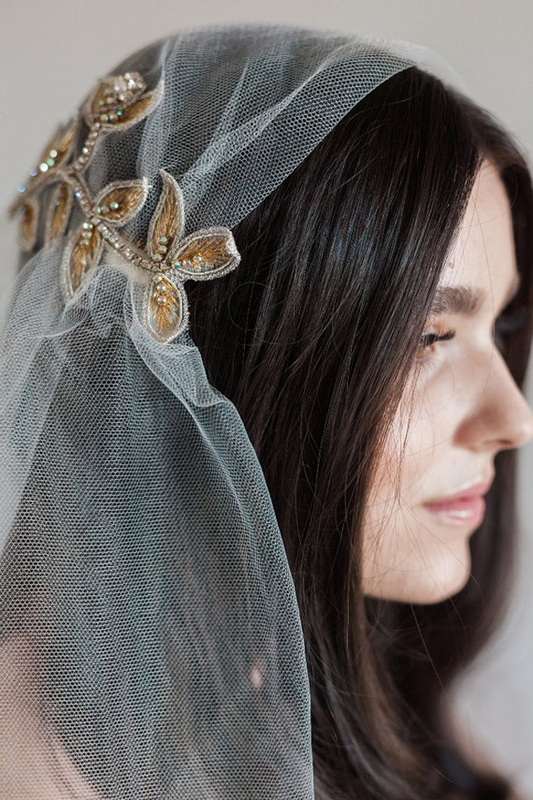 The second veil is an exquisite lace adorned mantilla veil with gold embroidery and pearl beading. Amazingly pretty! This mantilla inspired bridal veil incorporates beaded floral appliques in blush pinks and a lilac design. Just gorgeous. 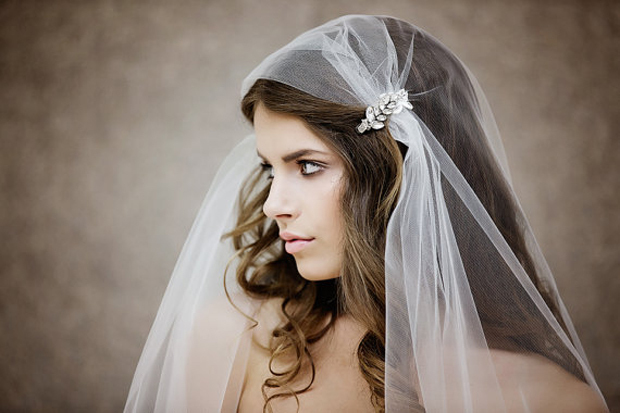 This is a gorgeous double layer veil with Juliet Cap style. A gold leaf applique with crystal details and rhinestone flower with pearl embellishments to the Juliet Cap. This next veil is a stunning drop veil with a wide horse hair edge for a classic look. 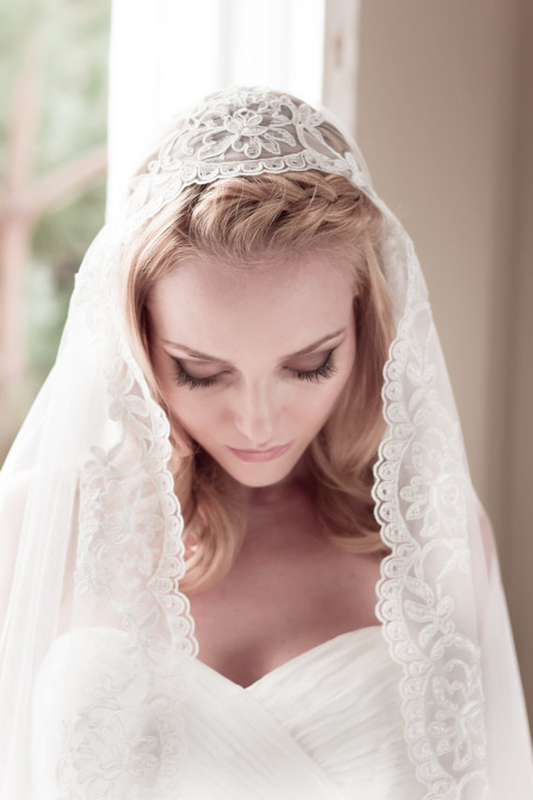 Beautiful lace adds delicate details to the veil. 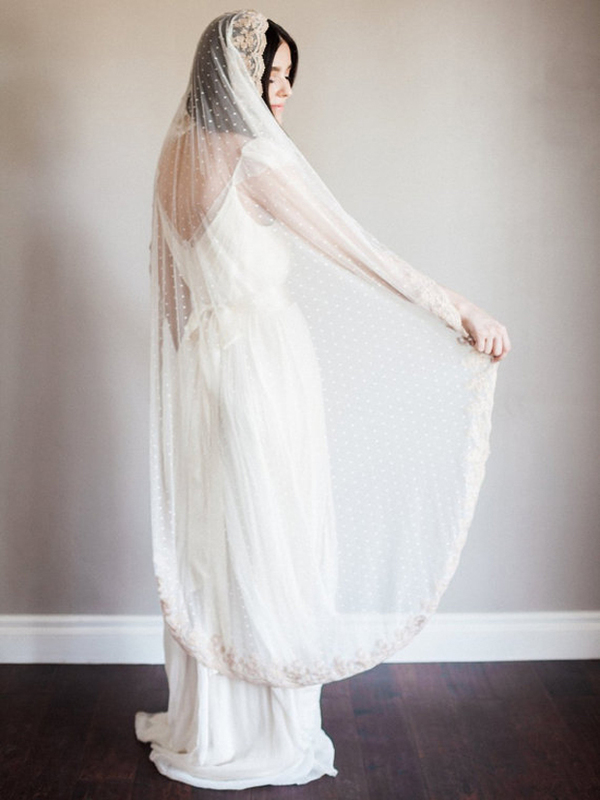 The first veil below is a stunning Swiss dot circle veil with a lace trim made using beautiful Point D’esprit veiling. It has a delicate scalloped lace trim throughout the edges. 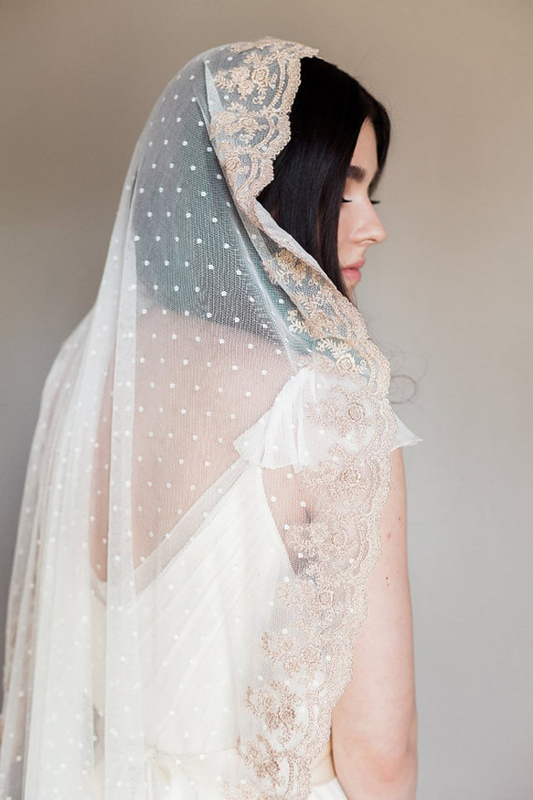 The second veil is a Spanish inspired Swiss dot mantilla, made using Point D’esprit veiling and beaded Alencon lace. 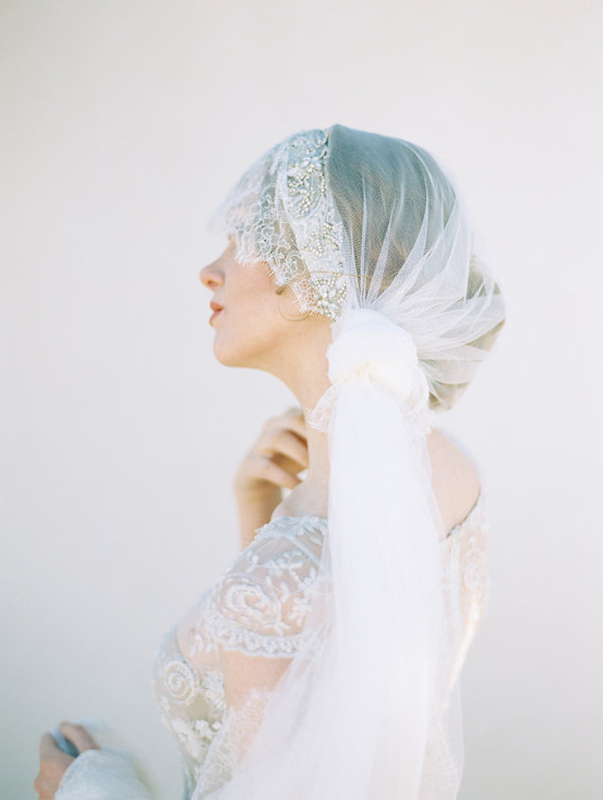 This very unique lace tassel trim veil is made with gorgeous Venice lace. 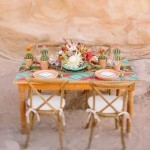 Perfect for a unique boho bride. Our next stunning veil is cut from luxurious English net tulle with scalloped edges in beautiful Alencon lace. 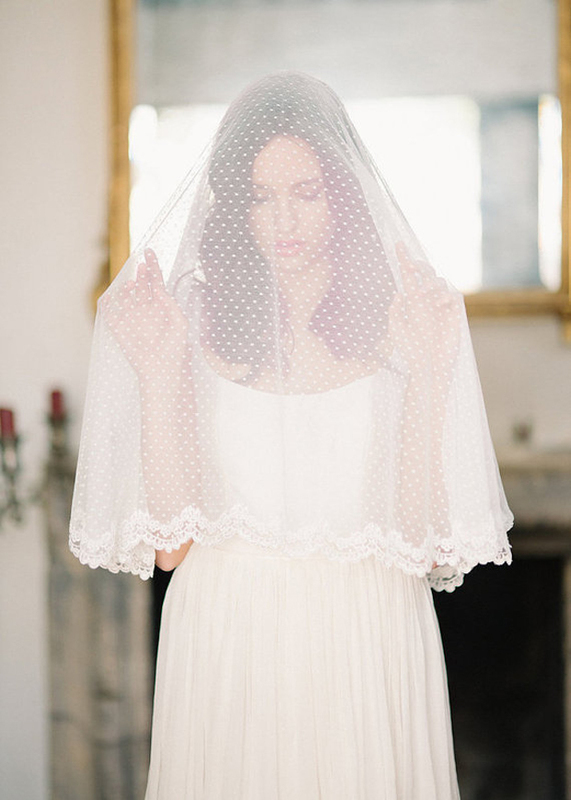 The Allure veil is created with ivory tulle with white polka dots. The edge is finished with a beaded ivory corded lace edge. The entire veil is sewn by hand and is such a delight! 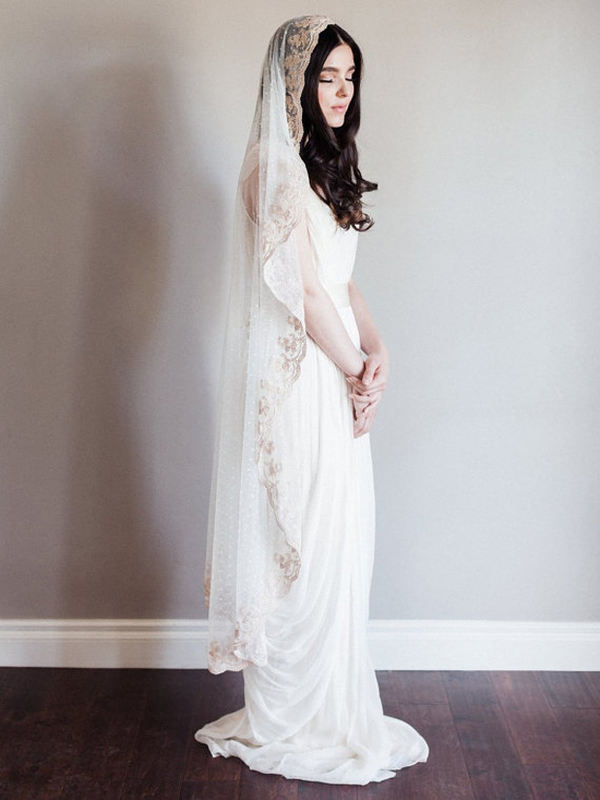 This beautiful chapel length mantilla is ridiculously romantic! The applique detailing is exquisite. And finally? My last share is not quite a veil but a silk train!! This stunning item is made using illusion tulle and has intricate adornments of crystals and seed beads along the shoulders and front. I imagine this worn with a very simple strapless gown to allow the train to take center stage. 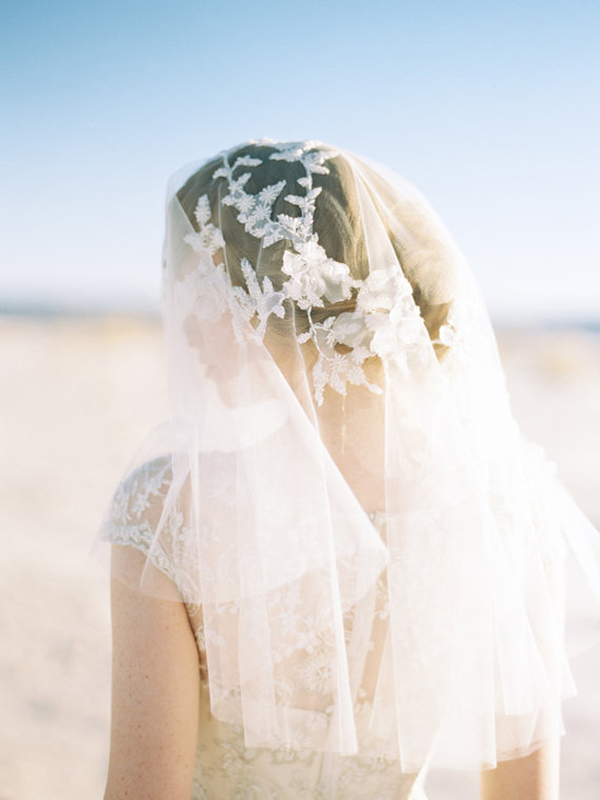 What an absolutely beautiful curation of wedding veils! Whether you’re looking for something slightly different or utterly romantic and chic, I’m sure your dream veil can be found here. 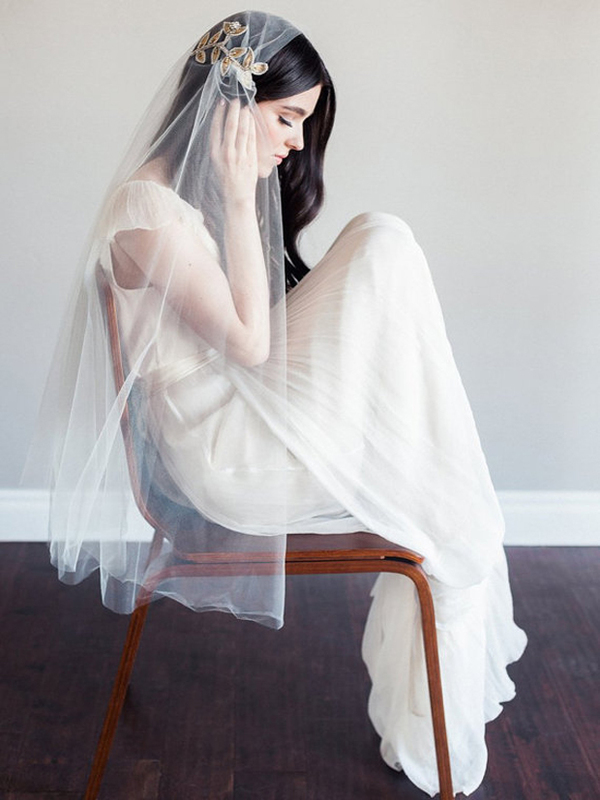 Want to shop these veils? 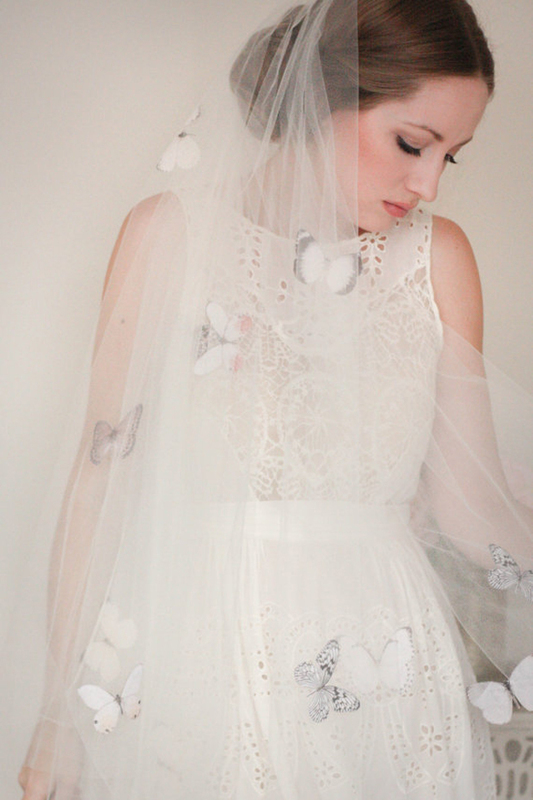 Browse my favourite etsy veil finds here. 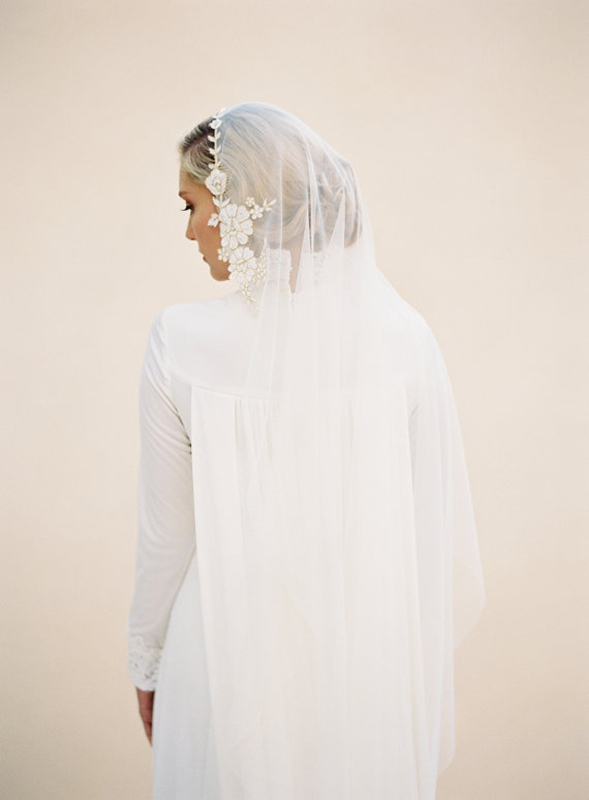 Need advice on what type of veil to choose? Read this. 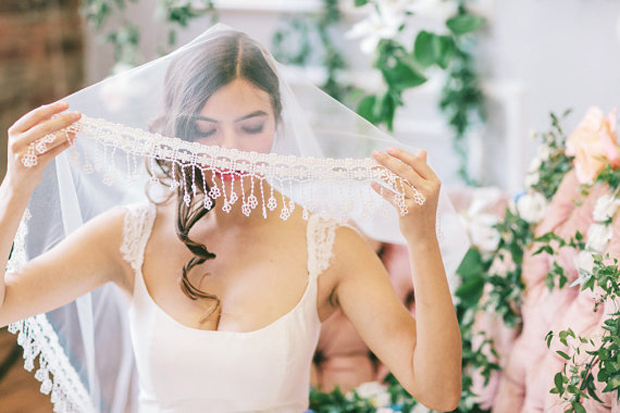 How To Wear A Mantilla Veil On Your Wedding Day and Unveiling The Veil | Ultimate Guide To Bridal Veils. Beautiful images. 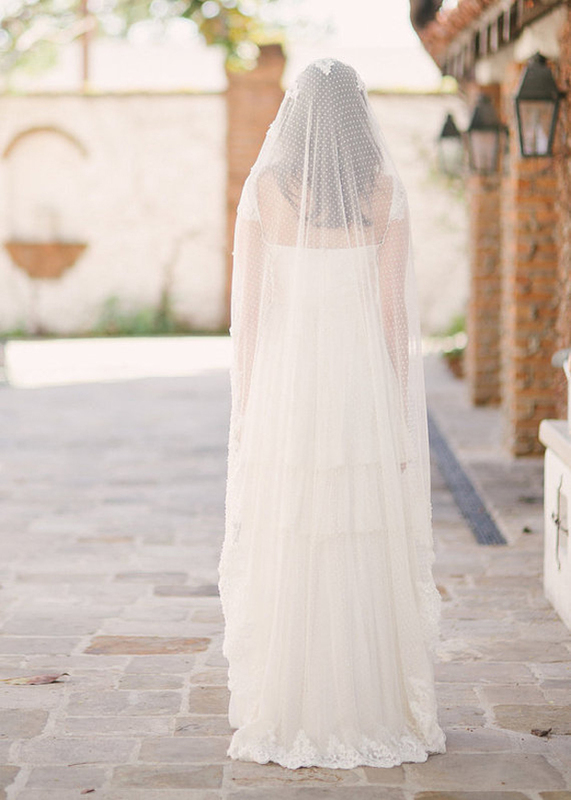 Always a fan of the veil, gives such softness to a wedding look. Lovely post. Thank you for the feature!